In the aftermath of Hurricane Florence, transportation throughout North Carolina has become an issue. As the storm made landfall last weekend and slowly moved west, it dumped trillions of gallons of water onto North Carolina and South Carolina, creating a 1,000-year flood event. Highways throughout the state have become rivers. Wilmington and some other areas of the state are simply inaccessible. State officials and highway engineers are closely monitoring the safety of our state’s transportation infrastructure, including bridges. Last month, as the death toll from last month’s Morandi Bridge collapse in Genoa, Italy, rose to 43, we also wondered about the safety of the structures that we cross every day on our commutes to work or school. “Can it happen here?” we asked. Earlier this year, a pedestrian crossing at Florida International University in Miami fell onto a busy road, killing six. Even closer to home, a pedestrian bridge collapse on Wake Tech Community College’s northern campus killed one construction worker and injured four other people in 2014. Flood damage caused by Hurricane Matthew in 2016, near Raeford, North Carolina, in 2016. A bridge failure can have one of several causes, including natural disasters like an earthquake or flood, excessive loads, and wear and tear. Design flaws, construction flaws, or impacts from a heavy object such as a barge or truck may also be to blame. Alpha & Omega Group, as a bridge design and inspection firm, is dedicated to identifying potential issues and developing solutions that keep our bridges safe for the traveling public. “There is inherent impact design built into a bridge, depending on the natural forces of a given region,” said A&O Vice President Glenn Zeblo, PE. For example, bridges at the coast are engineered with extra loading for heavy winds, to withstand hurricanes, he explained. Structures in the mountains of western North Carolina are designed to withstand loads of snow and ice. Similarly, bridge engineers in the western United States design for seismic activity to make bridges more resilient to an earthquake. A&O inspected the 1963 Bonner Bridge in 2006 and designed repairs to stabilize it until a new bridge could be constructed. Another natural force that can destabilize a bridge is scour, or water erosion, of the supports. One high-profile example is the 1963 Herbert C. Bonner Bridge, connecting Bodie and Pea Islands in North Carolina’s Outer Banks. 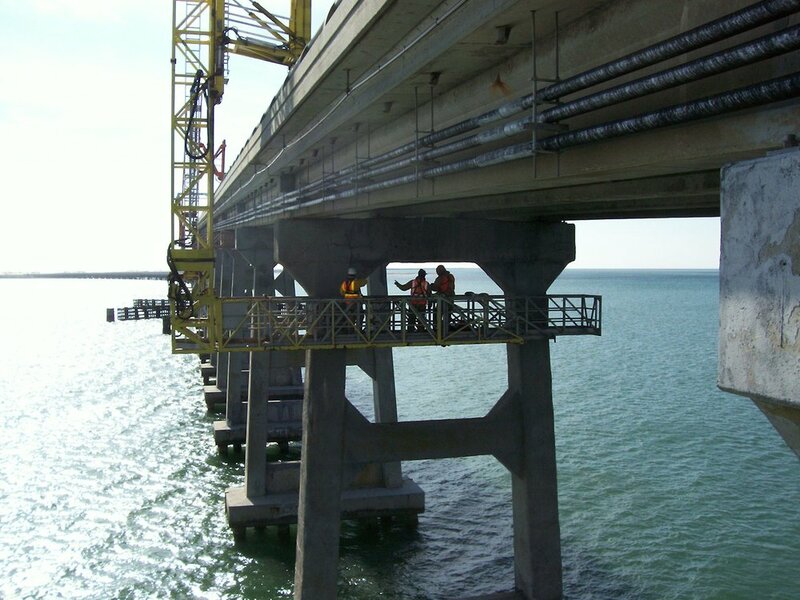 A&O performed a National Bridge Inspection Standards (NBIS) inspection on the Bonner Bridge in 2006. “The piles weren’t deep enough,” said Glenn. “The tide is strong there, and the current shifts the sand. As we were going out in the boat to inspect, the boat captain observed that in just one day, the navigational channel in the water shifted from one bridge span to the next. That’s 20 feet of sand moving overnight,” he added. To stabilize the bridge, A&O designed repairs to the structure, while NCDOT installed concrete “jacks” – giant star-shaped objects resembling the children’s toy – around affected bents and piles to hold sand in place. A replacement is currently under construction, expected to be complete by September 2019. A&O has worked with the North Carolina Department of Transportation since 2000 to conduct NBIS element inspections on the state’s 18,000 bridges and culverts throughout North Carolina. Each bridge is inspected every two years by a certified company. To ensure the safety of all bridges for public use, we perform non-destructive “hands on,” visual inspections of each structure’s railings, decks, expansion joints, superstructure, and substructure. We cover the entire bridge from top to bottom, documenting and photographing cracks, impacts, and deteriorated concrete. 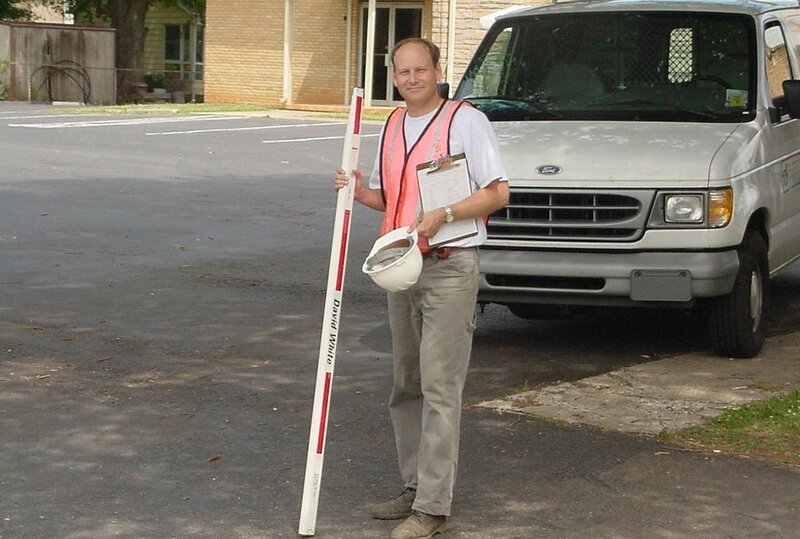 We check for “spalls” and “delaminations,” or areas of concrete erosion caused by sodium chloride or pollutants in the air, by tapping with a small mallet or using an electro-sonic device, to detect hollow spots in the concrete where moisture has seeped in and corroded the steel reinforcement. The rust expands 12 times the original size to create the spalls and delaminations. Other methods of inspecting may include destructive testing, taking core samples of concrete, to analyze the strength and quality of the concrete. Inspectors may also use ground-penetrating radar or LiDar (light detection and ranging), a method that uses light pulses to measure variable distances and generate three-dimensional images of the structure. Each bridge inspector documents findings in NCDOT’s Wigins reporting software, where they are reviewed by inspection team leaders and project managers before sending to NCDOT. Once NCDOT engineers get the report, several sets of eyes will also review it and decide on what actions to take for anything needing attention, explained Glenn. What if bridge inspectors see a problem on a bridge that needs immediate attention? According to Glenn, there are three levels of alerting NCDOT to urgent bridge maintenance issues: priority maintenance, in which NCDOT has a 30-day window to resolve an issue; critical find, which is an issue requiring remediation in just a few days; and imminent failure, reserved for issues that are so severe that the bridge should be closed immediately. Because of the two-year inspection cycle, said Glenn, bridges are rarely closed because of imminent failure – however, it occurs occasionally when a bridge is deemed unsafe. This bridge in Iredell County, along State Road 1863 over Rocky Creek, was closed earlier this year because of structural problems that made it unsafe. A bridge in Iredell County, along State Road 1863 over Rocky Creek, was closed earlier this year, upon a recommendation by A&O inspector Michael Meyer, PE. Used by about 70 vehicles per day, the steel beams under the bridge were rusting through and beginning to “deflect,” or to bend and buckle – a visual indicator that there is a serious structural problem, explained Michael. A&O project manager Matthew Moyer, PE, talked about the importance of regular inspection and maintenance to extend the life of a bridge. “It’s like if you own a house or a car, and you do regular maintenance, that house or car lasts longer,” he said. “By understanding the inspection and what it tells you, you can find the appropriate fix,” he continued. So, for example, inspectors need to understand which crack or area of deterioration is important to the structure before recommending a repair. “Having a dent in the body of your car that doesn’t affect the way it runs is very different from having a hole in the radiator,” said Matt. No system is foolproof, Glenn points out. “The fact is, we are human. We all follow the checklist and guidelines, trying not to miss anything,” he said, but NCDOT’s system of having different companies and different people inspect each bridge on a two-year cycle greatly reduces the chance that a bridge will collapse simply from neglect. Applying knowledge and experience can help extend the life of our state’s bridges so that maintenance dollars help offset the escalating cost needed to replace our aging infrastructure. “Begin with the End in mind.” Alpha & Omega Group’s tagline appears on our letterhead, business cards, website – all our branding materials. 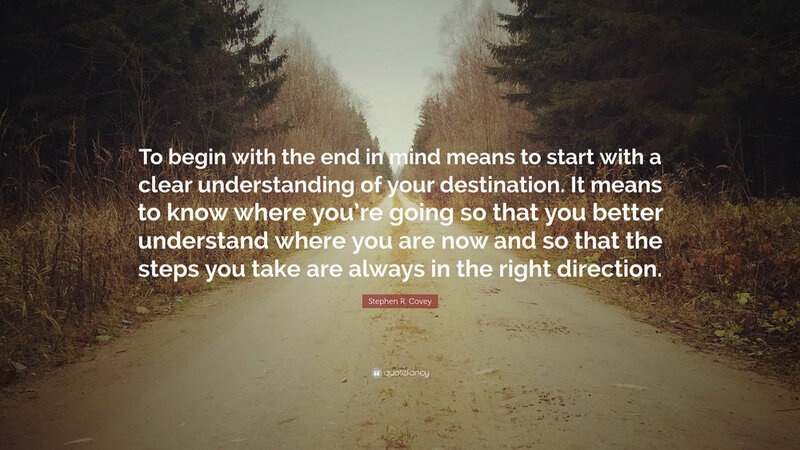 A&O President Ted Bartelt wrote a blog post on what he had in mind with “Begin with the End in mind.” Our tagline has many different levels of meaning, depending on one’s perspective. Clients see it as a promise that we will fulfill their goals of a given project – a nice greenway bridge for residents to walk or cross on a bicycle; a safe highway bridge to drive across; or efficient stormwater control that will prevent contaminants from getting into our lakes, streams, and drinking water. Ted spoke of how he sees it as having an eternal, spiritual meaning that transcends the here and now. To him the tagline gives him greater responsibility, because in serving clients for the sake of public safety, he is also serving God. 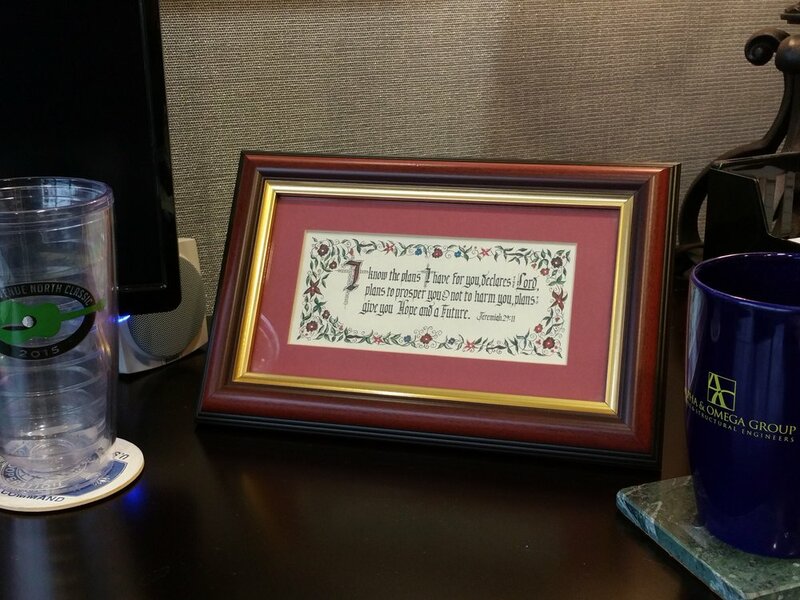 How do A&O employees understand this motto? None of the current employees have been around since the very beginning of A&O, although we have learned the story of how our company began. We certainly want A&O to continue for many years. When considering beginning – end, we are living the dash in-between. The dash in-between is much more than an insignificant punctuation mark – it is where the rubber meets the road. Sometimes the dash in-between feels like a dash, or a sprint – when we work hard to meet deadlines and to complete a job with excellence. But rather than a competition, we see the dash as a cooperative, team effort. We support and help each other achieve our goals. The dash in-between is where we, as members of this team, live out all six core values of A&O: relationships, teamwork, trust, servant attitudes, stewardship, and excellence. At the beginning of every week, we have a meeting we call “Monday Momentum,” or “Monday Mo,” for short. At this meeting, we discuss values and character traits that are important in the workplace and consider how to apply them to our current workload. Monday Mo inspires us and sets the tone for the coming week. We strive to fulfill these values, not only because our company leaders expect us to, not just because clients expect us to, but we expect it of ourselves. This is a small company, and we feel like a family. Ted and Glenn Zeblo, our vice president and co-owner, care about us, and we all care about each other. Whether any of us is facing a health problem, an issue with a family member, or a challenge with our work, they listen and help if they can. They also pray for us. They trust us to do a job well, to use our creative abilities to solve problems. Because of these trusting relationships, we strive to do our best work. While they might not like to be reminded, both Ted and Glenn set an example for the rest of us in their lives and in their work – and we try to live up to the example. In short, Ted and Glenn’s management style makes us better, both as employees and as people. We are somewhere in the middle of the timeline of A&O – the dash. While we don’t really want to think about the end of A&O, we do want the company to be known for all of those core values mentioned above – they are not just some marketing blather, but have real meaning and importance to us. We want the company to be known as a great place to work, where we all become better at what we do and how we live and interact. We want all those we serve to think of us as a reliable, trustworthy company that can solve a problem with integrity, creativity, efficiency, and excellence. In our dynamic world, one thing that remains constant is change. All industries have been affected by changes in technology and how we produce our work in the 21st century. Engineering is no exception. 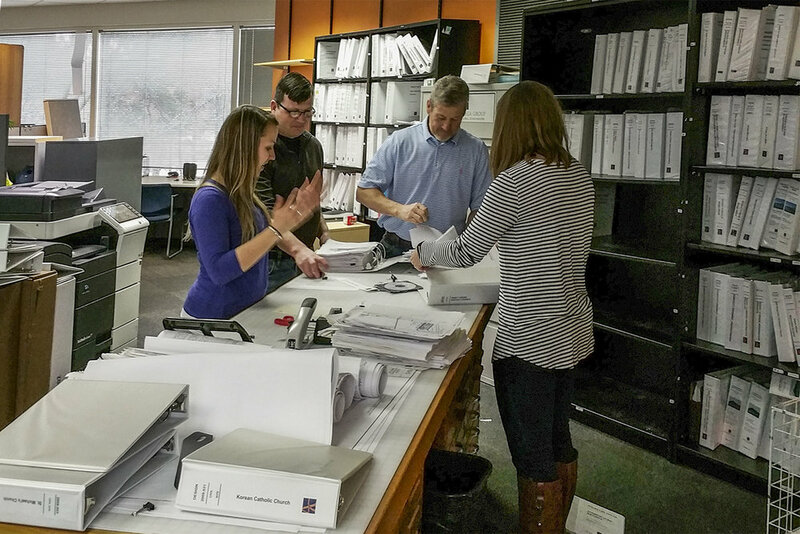 A&O’s leaders, Ted Bartelt, PE, and Glenn Zeblo, PE, have witnessed a transition of reliance on documents, drawings, and bluelines produced and delivered on paper, to digital files that can be delivered electronically, through cloud and file transfer systems. 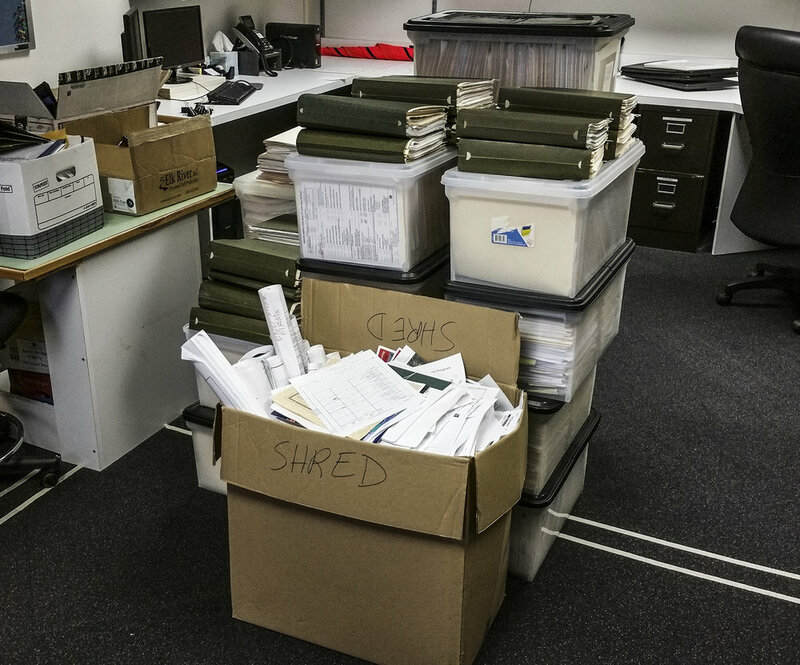 In the 20 years of A&O history, a lot of clutter has accumulated in our office. 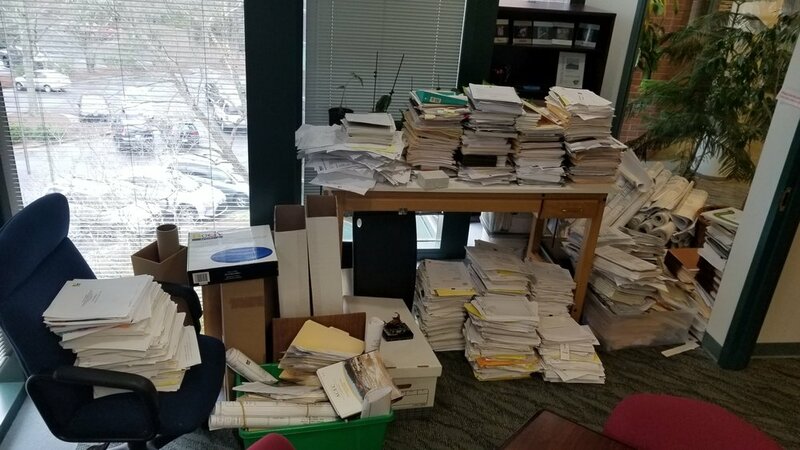 Sure, we’ve organized clean-up days, but in general, our office has been filled with an ever-growing collection of file cabinets, drawers, closets, and boxes filled with paper. In the earliest days of transition to digital information, it is easy to understand why it would be necessary to keep paper as a back-up in case electronic systems fail or are accidently erased. But over time, electronic storage capacities have improved and expanded, so now there no need to keep much paper. However, our files on the computer are not as well-organized as they should be. Company President Ted Bartelt said, “I don’t have any problem getting rid of the paper if I know we have scanned and saved it to the computer. For me, I let things pile up because I wanted to know what direction we are going with our electronic filing system.” He added that often, when he searches for a file on the computer, he is unable to find it, so he ends up recreating it. 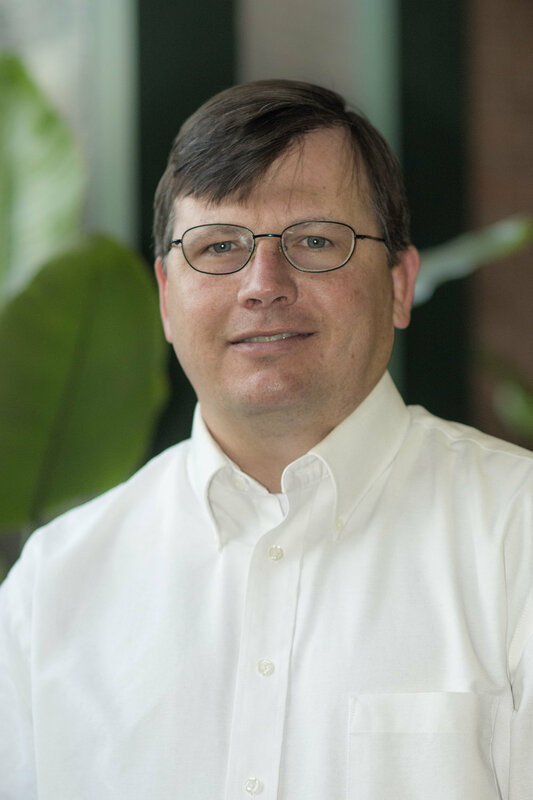 Projects, reference documents, marketing material, accounting, human resources, and other digital files are referred to by different names by different people in the company, said Jeff Goodin, IT director. “This leads to a Tower of Babel effect when we go to search for information about the projects,” he pointed out. To solve the problem of clutter, A&O hired professional organizer Barbara Hemphill, founder of Barbara Hemphill, LLC, based in Raleigh. Barbara’s message on her company’s website is that unnecessary office clutter slows down productivity and creates stress, frustration, and low morale among staff. “Many organizations don’t realize the cost of their unproductive environment,” she said. Because of a lack of organization, clutter can cause staff to spend too much time searching for the things they need, wasting companies time and money. In what form and where? Barbara had us set up three categories of items for the clean-up. The shredding pile was for sensitive documents in which privacy or security is a concern. We decided that because we were limited to a half day, rather than try to decide whether a document fit the sensitive category, we would simply shred all the paper that needed to be disposed of. The next pile was “trash to treasure” for items that people no longer wanted, but thought someone else might like to have, and the third pile was a staging area for items that we were unsure what to do with. Emily agreed. “We had a lot of fun. We found a lot of interesting old documents. I learned what a blueline is,” she said, referring to the old technology of reproducing engineering drawings with ammonia vapor. The next step in the process will be to better organize computer files. Someone will be assigned to each area of the network drives to reorganize files according to a naming convention that will be standardized among each area, making files more searchable. In naming computer documents and files, said Barbara, it is important to consider all the ways a person might look a project up. Project numbers, dates, key words, or clients may all be important in this consideration, she said. Project Manager Matthew J. Moyer, PE, will manage bridge inspections for A&O. Alpha & Omega Group is pleased to announce the addition of a new project manager, Matthew J. Moyer, PE, to manage bridge inspections. Matthew is focused on NBIS bridge inspections, condition assessments, bridge repairs, rehabilitation, and bridge preservation. We are very excited to have Matthew on our team as we continue to serve state, municipal, and county clients throughout North Carolina. Occasionally, an opportunity comes along in my engineering career to be a part of a truly inspirational project, a structure that sparks my creative energy and offers something special and unique to the people who will use it. These projects capture my imagination from the beginning and hold a place in my memory long after they are completed. Ebenezer Chapel is one of those projects. It was born of my friend Mark Boone's vision to build a chapel on his property in Raleigh, NC. This is not simply a sweet gazebo or family chapel with a basic seating and floor plan. Mark’s vision is to create this chapel completely underneath a massive granite outcropping that will last thousands of years. Think of the pyramids of Egypt, but with a focus on sharing history, worship and peace. The chapel will be 80 feet below the ground with an 800-foot entrance ramp at a 5% grade on a small triangular piece of property. Building this chapel will require expert mining techniques, an understanding of the granite, and the will to take it on. Honestly, I'm in awe of the various elements and skills sets Mark has brought to this venture. The chapel, as a start, is being called a mine. And this brings up interesting and unique challenges that make me wonder about the ways ancient structures - now relics - were built. Who would think of digging a pit, hundreds of feet below the surface, installing oak platforms at 10-foot levels, placing a coded message on a stone tablet 90 feet below, creating flooding tunnels to the shore, and going to a depth of more than 200 feet with very basic tools? As an engineer, I have been captivated, because this is work! I imagine what it would take and shake my head. People have been trying to unearth this treasure for more than 200 years. Even President Franklin Delano Roosevelt once took part as a curious treasure hunter. More recently, seekers have used modern equipment and scientific methods to try to "crack the code" and get their hands on this elusive prize. Millions of dollars have been spent with no results. President Franklin D. Roosevelt is thought to have explored the money pit on Oak Island with friends in 1909. There are rumors that it is treasure from the famous Captain Kidd. And there are rumors that it's a collection of religious artifacts that that pre-date Christopher Columbus, brought from Europe by the Knights Templar and hidden away for safe-keeping. As a student of the Bible, the possibility of this secret bounty turning out to be King Solomon’s treasure or the lost Ark of the Covenant adds even more intrigue to the mystery. It also leads me to other thoughts about hidden treasure and the need to search for something of value. There are earthly treasures and there are heavenly treasures. Earthly treasures are fleeting and temporary, but heavenly ones are eternal. The Bible is a Christian's map filled with clues and prophesies regarding the treasure in heaven. “The kingdom of heaven is like treasure hidden in a field. When a man found it, he hid it again, and then in his joy went and sold all he had and bought that field." (Matt 13:44) The whole Bible points to the Messiah who came to this earth in the human flesh of Jesus Christ. Jesus is the key that opens the door to heaven’s treasure. Seek him. Knock, and the door will be opened. As an engineer for Ebenezer Chapel, my hope is that it will lead people to discover God’s eternal treasure for the next thousands of years. The project is in its infancy and a key milestone is on the horizon. Coring the rock is needed to determine the quality of granite on the site. Once the quality and depth of sound granite are known, we will know how deep to set the chapel floor. Ted Barelt, PE, is founder, president and structural engineering principal of Alpha & Omega Group. The earliest half of the twentieth century in the United States ushered great growth in technology and transportation. Newly constructed highways and bridges, built under the Federal-Aid Road Act of 1916, allowed people and goods to cross the nation with unprecedented speed and efficiency. Later, President Roosevelt's Works Progress Administration and President Eisenhower's Interstate Highway System expanded our transportation infrastructure even more. Eventually, however, new construction slowed, and existing structures began to age. 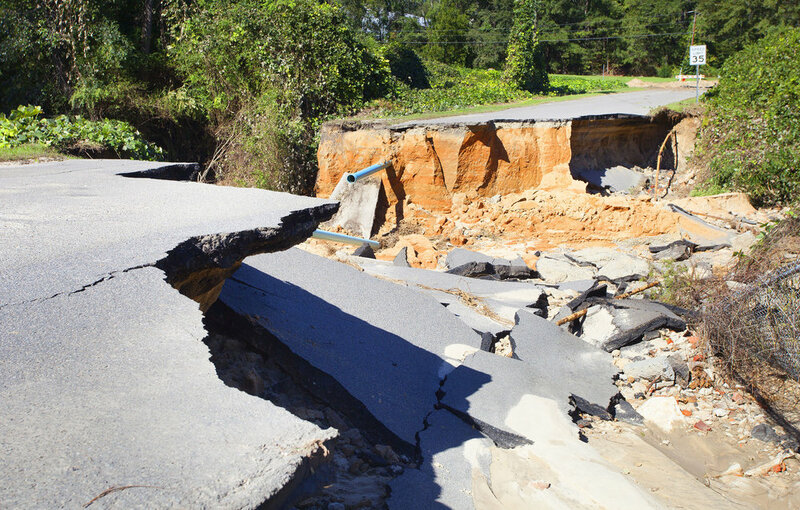 With fatal infrastructure catastrophes such as the 1967 Silver Bridge collapse in West Virginia and the 1983 Mianus River Bridge collapse in Connecticut, public concern grew over the safety of our nation's bridges, tunnels, dams and other structures. The North Carolina Department of Transportation, following the Federal Highway Administration's National Bridge Inspection Standards, has implemented an aggressive inspection program, employing private engineering firms around the state to assess the structural stability of our transportation infrastructure and to make recommendations for needed repairs. An A&O bridge inspector “sounds the element,” tapping lightly against the bridge structure to identify deficiencies in the concrete.